In this third archive story by Kristian Bertel, we have an encounter with a beggar boy in the capital of India. Since Independence, Delhi has prospered as the capital of modern India with its population spiralling upwards due to rapid economic expansion and increased job opportunities. But not everybody benefits from growing economy in the country of India, there is also a downside with an increasing difference between the rich and the poor. Here a beggar boy is pictured by the photographer in New Delhi, India. The harrowing face of a boy begging in New Delhi's streets caught the eye of photographer Kristian Bertel, when he visited the Indian capital. Life is hard in the streets of New Delhi, India, despite that India is a country with a rising economy. The downside of this boom, apart from growing preassure on on the city's groaning infrastructure, is chronic overcrowding, traffic congestion, ballooning child labor, housing shortages and pollution. 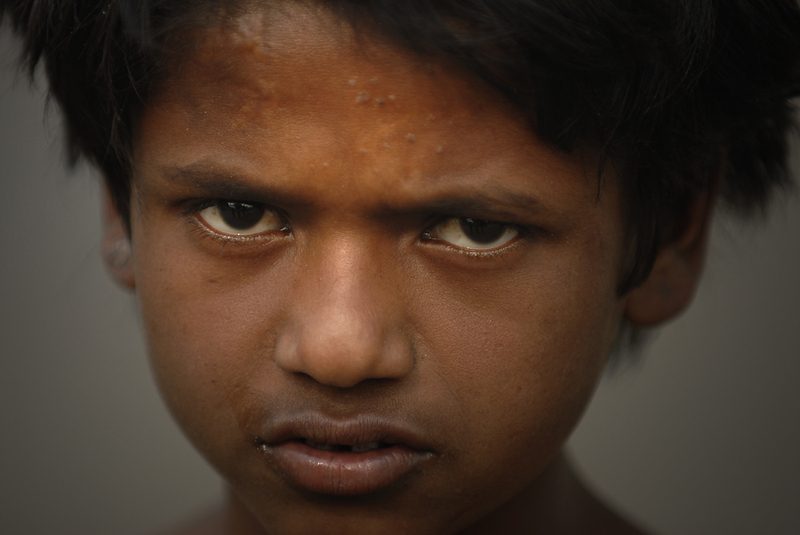 More than 300,000 children are believed to live on the streets of New Delhi. Some estimates put the total number of street children in India as high as 18 million. The photographer walked in many areas of Delhi and in the area around the railway station introduces all the noisy, smoky, smelly, crowded and chaotic. Everything that there is not a part of New Delhi that you will consider a tourist destination. But also on the more rich quaters like Rajiv Chowk, where the youg beggard boy was photographed theses contrasts are ruling. Most of the begging children and street children in India live in unhygienic, neglected and unspectacular circumstances. Many suffer from malnutrition and diseases like tuberculosis, typhus, leprosy, malaria or worse. In addition, they are quickly dependent on drugs and alcohol. They suffer from exhaust fumes. It is noticeable that many suffer from skin diseases and bone fractures. These diseases usually remain untreated and unaffected. Insecurity and discontinuity of life on the road cause mental illness in many children. The psychological traumatization as a result of neglect, neglect, insecurity, lack of protection, exploitation, abuse, abuse, hunger and dependencies of all kinds are serious. The treatment of begging children in India is ambivalent. Children are highly appreciated. But the image of street children living in the cities of the country in misery has been part of everyday life for many decades and hardly seems to surprise anyone. Street children are there and are not really seen and perceived. Many meet with defenses and contempt. Some support them with small money donations. Religious representations of Karma, Dharma and Moksha in Hinduism are apt to reinforce a certain indifference. Many Hindus do not seem to feel compassion, and do not feel compelled to act against street children. The existence of these children appears to them as a result of a bad karma. Children are therefore responsible for the fact that they are suffering from such adverse circumstances. Anyone who nevertheless feels compassion and decides to be a small support can strengthen his own karma. The situation of children in Indian cities in the street is very different. One can speak of children on the street. They often came from the country to one of the great metropolises with their families and live in slums or in the outskirts of the cities. They are used as shelters, pipes, sewers. The children of these families live and work on the street, and it is estimated that only about ten percent of them have a firm job, such as a street vendor, a tea shop or other small business. There they often work more than sixteen hours a day, are used up and badly paid. The other ninety percent are struggling with occasional work, trying to support their family. On the other hand there are the classic street children who, unlike children on the street, no longer have contact with their parents or other family members. They have run away or have been exposed and are now trying to break through typical street children's work, mainly collecting and selling rubbish. When visiting India you will find beggars on the streets of India even child beggars that will break your heart the photographer recalls. It is almost inevitable not to see and hard to ignore. Beggars in India is a reality and despite a growing economy in India many people are still left behind in the society of India. The presence of a large number of child laborers and the begging children in India are regarded as a serious issue in terms of economic welfare. Children who work and beg are failing to get the necessary education. They do not get the opportunity to develop physically, intellectually, emotionally and psychologically. In terms of the physical condition of children, children are not ready for long monotous work because they become exhausted more quickly than adults. This reduces their physical conditions and makes the children more vulnerable to disease. Children in hazardous working conditions are even in worse condition. Children who work, instead of going to school, will remain illiterate which limits their ability to contribute to their own well being as well as to community they live in. Child beggars have a long term adverse effects for India like the boy portrayed in this archive story. He was accompanied by a woman, who maybe was the mother of the boy. While 18 million children work on the streets of India, it is estimated that only five to ten five to twenty percent of them are truly homeless and disconnected from their families. Because the street children in India have unique vulnerabilities the amount of time they spend on the street, their livelihood depending on the street, and their lack of protection and care from adults, they are a subgroup of the Indian population that deserve specific attention in order to ensure that their needs are known. "- As the most vulnerable group of children in India and they need to be understood as much as possible", the photographer says. India is a land full of stories. On every street, on every corner and in the many places in India, life is rushing by you as a photographer with millions of stories to be told. In the archive story above, you hopefully had a readable insight in the story that was behind the photo of a beggar boy in New Delhi. On this website of Kristian Bertel | Photography you can find numerous travel pictures from the photographer. Stories and moments that tell the travel stories of how the photographer captured the specific scene that you see in the picture. The photographer's images have a story behind them, images that all are taken from around India throughout his photo journeys. The archive stories delve into Kristian's personal archive to reveal never-before-seen, including portraits and landscapes beautifully produced snapshots from various travel assignments. The archive is so-far organized into photo stories, this one included, each brought to life by narrative text and full-color photos. Together, these fascinating stories tell a story about the life in India. India, the motherland to many people around the world, a land of unforgetable travel moments. The archive takes viewers on a spectacular visual journey through some of the most stunning photographs to be found in the photographer's archive collection. The photographer culled the images to reflect the many variations on the universal theme of beauty and everyday life in India. By adding these back stories the photographer's work might immensely enhanced the understanding of the photographs.